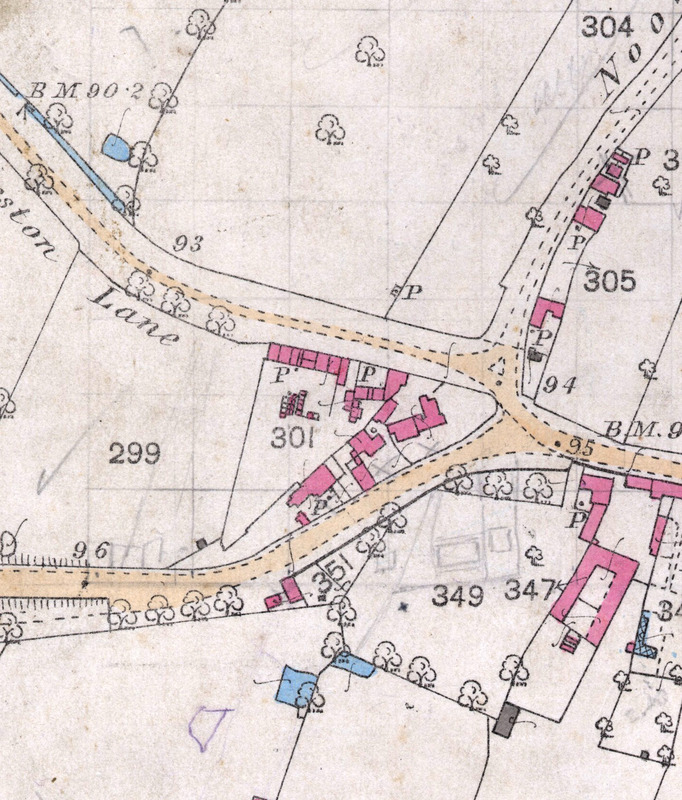 Part of a detailed OS map of Bottesford, showing the terrace of houses that stood on Orston Lane before WW1. Outline map of Scapa Flow and the Hoy Sound. William Gilden is recorded on the Bottesford Absentee Voters list, 1918, which informs us that he served as 2108(S) Private, Land Defences, Scapa Flow Ch. The name is slightly confusing, in that the Absentee Voters list gives it as Gilder, but census and BMD records indicate that it was Gilden. We have found no record of anyone called Gilder in the Bottesford area. There is a further complication in that his family often spelt their name Gilding, and in fact William Gilden was sometimes recorded as William Gilding. However, Gilden was the name he used when he had left home, and is the name on his Birth, Marriage and Death records. William Gilden was born on the 28th September,1881, in Bottesford. In the 1891 census he is recorded as the second son of bricklayer’s labourer Daniel Gilding and his wife Mary Jane Stevenson, who had married in 1877 and at the time of the census lived at 9, High Street, Bottesford. William was one of five children, including brothers Frank, John and Tom. Daniel Gilding was the son of Thomas Gilden and Ann Wickham. However, in the 1901 census, William Gilden’s grandparents are given as Thomas and Alice Gilden, living round the corner in Albert Street. It seems probable that Ann Gilden (nee Wickham) and Alice Gilden are the same person, the change being a clerical error, but this is not entirely certain. 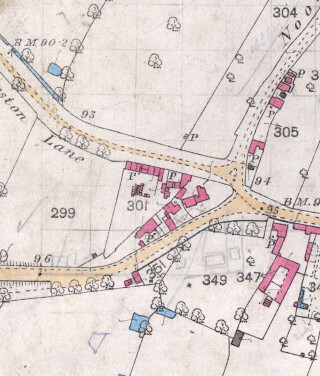 Also in 1901, William’s great-uncle and great-aunt, Joseph and Mary Gilden, lived on Orston Lane in one of the terrace of cottages on what is now known as Bowbridge Lane, which can be seen in the accompanying map. These were demolished in the 1960s and replaced with the modern houses seen today. William Gilden left school to become a gardener. In 1901, he was a market gardener’s assistant employed by Arthur Webb, a florist and farmer in the village of Kelham, near Newark, Nottinghamshire, sharing the ‘Gardener’s Bothy’ with three other young gardeners. He married in 1909, at Newcastle, to Janet Grace Smith, who came from Springholme, Kirkudbrightshire. By the time of the 1911 census, he had become a domestic gardener at 5, Rose Mount, Newchurch, Rawtenstall, Lancashire, in 1911, and it was here that their son George had been born in 1910. Theirs was evidently an itinerant life, moving from place to place where there was work to be had. He enlisted in 1917, and it was probably then that his wife and son moved to Bottesford, to the address given in the Absentee Voters List as Orston Lane. This was most probably the house where great-uncle Joseph Gilden lived out his days. We have no information about his two years service with the Royal Marines other than the single record sheet, part of which is displayed on this page. When William Gilden enlisted on 17th February, 1917, he was 36 years old, and had presumably been conscripted into the forces. The service record states that he was five feet eight inches tall, with a fresh complexion, blue eyes and dark brown hair. His ability was recorded as satisfactory, his character described as very good. He joined the Royal Marines Light Infantry (Chatham Division), and was sent to defensive duties at Scapa Flow, then demobilised on 3rd April, 1919, having received a Good Conduct Badge on 16th February, 1919. 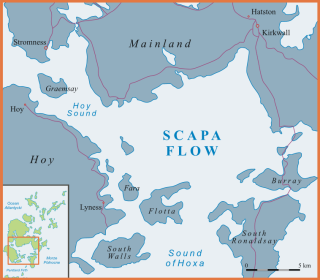 Scapa Flow was a vital harbour chosen as the base of the British Grand Fleet during WW1. After the Battle of Jutland in 1916 the harbour remained secure. The famous scuttling of the captured German fleet at Scapa Flow took place on 21st June, 1919, by which time he had been demobbed and had probably left the area. We have little information of William Gilden’s life after the end of the war. The family may have returned to the Greater Manchester area. Kelly’s 1929 Directory for Manchester, Salford and Suburbs shows a William Gilden (assuming this is the same man). The BMD records the death in 1953 of a William Gilden, aged 70 (almost certainly the subject of this biography), in the Wrexham area. This suggests that he may have continued to work as a gardener, moving from place to place. Probate was granted to George Gilden, a gas engineer, and a Jean Palmer. His wife Janet Gilding died at Stockport in 1959, aged 81. George had married a Kathleen Chadd at Bucklow, Cheshire, in 1937, and they had a daughter Janet M Gilden, born in 1938. We gratefully acknowledge the family information Mr Louis Gilding has shared with us regarding the life and service record of William Gilden. Louis tells us that William Gilden’s grandfather, Thomas Gilding, was a son of one Mary Gilding, who had another son Henry Gilding (born in Bottesford in 1822) who was Louis’ great-great-grandfather.